The dynamic footrest provides an energy absorbing range of motion. Traditional wheelchair footrests only provide a place to park the foot and, when subjected to significant forces, may be damaged. Dynamic footrests absorb the energy transmitted by the user’s movement, protecting the client from injury and the equipment from damage as well as providing movement for therapeutic benefits. Dynamic Footrests provide up to three types of movement – a telescoping movement, knee extension, and plantar/dorsi flexion. By providing movement in response to client movement, forces are absorbed, protecting both the client and the wheelchair frame and seating system from harm. Extensor tone is absorbed and diffused, reducing overall tone and posturing. Movement is provided, which can increase sitting tolerance, decrease agitation, and increase alertness. Finally, by providing movement within a limited range, the lower extremities may experience strengthening. Some clients may benefit from only the telescoping feature. This client may have very tight hamstrings which limit active knee extension. The telescoping feature can still absorb and diffuse force. Knee extension, in combination with the telescoping feature, follows the natural arc of movement which occurs when the knee is straightened. Separate footrests capture movement in each leg during extension. Movement at the legs diffuses tone and limits movement upward at the pelvis. This video demonstrates the three movements available in the Seating Dynamics Dynamic Footrests. The first step in using any of the Seating Dynamics footrests is choosing the correct adapter / receiver. The Seating Dynamics footrest adapter / receiver allows any of our dynamic or static footrests to be used on many different wheelchairs. Depending on wheelchair manufacturer and model, different adapters may impact the final installed footrest length. 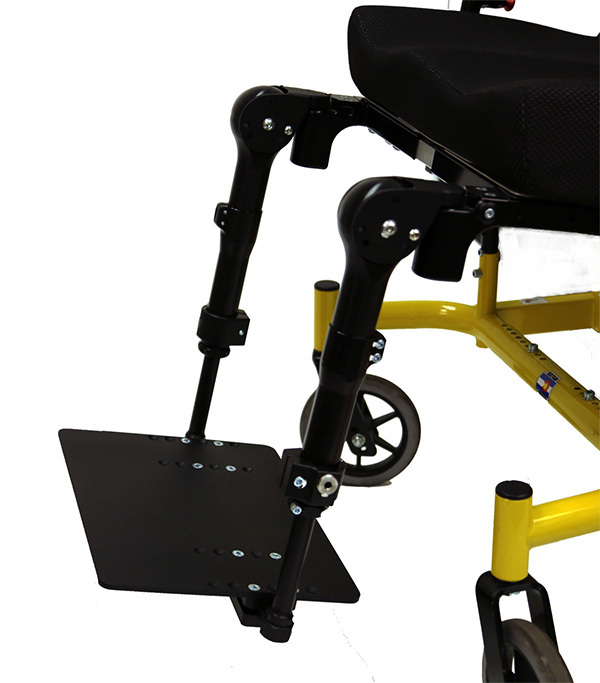 An offset receiver is available on some wheelchair bases which moves the Dynamic Footrest laterally by 1 inch. The second step is the determination of the upper leg style. The dynamic footrest, shown above with dynamic plantar dorsi flexion, provides dynamic telescoping movement to 1.5″ and dynamic elevation to 30° with the ability to set the initial (neutral / relaxed) position in one of five positions (90°, 80°, 70°, 60° and 50°). The Adjustable Knee Joint allows adjustment in 10 degree increments (90, 80, 70, 60 and 50). The Adjustable Knee Joint allows unlimited adjustment in 7.5 degree increments. This option can be used with a telescoping dynamic footrest, but not with a dynamic elevating option. The windswept dynamic footrest provides the same functions with the addition of an angle adjustable joint to rotate the footrest in or out, relative to the seat rail, in 7.5° increments to accommodate a windswept tendency. This option is not available on Dynamic Footrests with only the telescoping feature. The windswept option is available on both Dynamic Knee extension and non-dynamic / adjustable knee. The adjustable high pivot dynamic footrest features a 4.5″ raised pivot and height adjustment capable of raising the pivot point an additional 2” in ½ inch increments (for a total of 6.5” above the seat rail). This style is used with clients who have a shorter leg length and/or when seating equipment is added above the seat rail (such as a high profile cushion) which decreases the required footrest length as the knee is so much higher than the seat rail. The Reverse Offset (only available in Static P/D style) is also appropriate for clients with a shorter leg length and is indicated when the client has hip abduction which may lead to contact between the high pivot hardware and the lateral knees. The Reverse Offset eliminates this contact, while still accommodating shorter leg lengths. The third step is to select either static or dynamic plantar/dorsi flexion. The extensions are available in several lengths in 1” increments, each having 2.5″ of leg length adjustment. The static extension style offers no movement of the ankle and is appropriate for clients with AFO’s. The footplate is infinitely angle-adjustable with tools. The dynamic extension style has ± 10° of dynamic plantar/dorsi flexion movement. The footplate is infinitely angle-adjustable with tools. The fourth step is to select the appropriate size footplate. We offer small (4×6), medium (5×8) and large (6×10) foot plates. This is determined by the length of the client’s foot, the footrest style, chair width, caster size, and seat to floor height. Our footplates are heavy duty ¼” aluminum with pre-drilled holes for mounting foot positioning accessories. 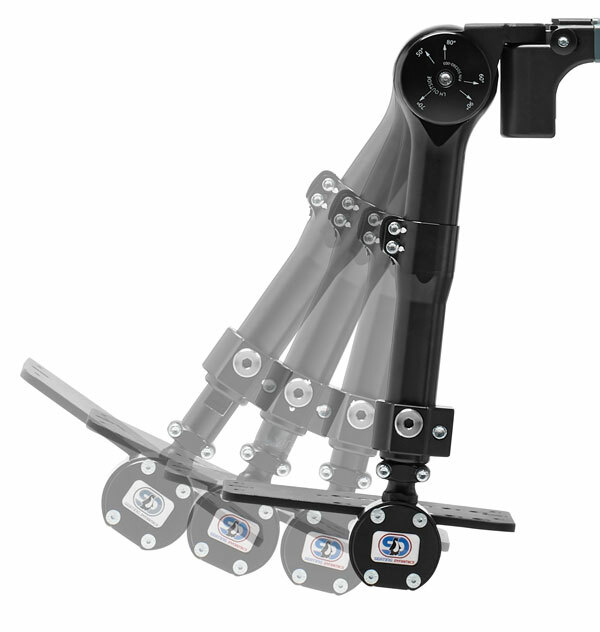 All footplates used with the plantar/dorsi flexion footrest extension are infinitely angle adjustable with tools. Most clients will require ankle straps or shoe-holders to maintain contact with the footrests during extension. The footplates flip-up for transfers. There are times when standard footplates do not meet the needs of an individual client and a footboard is required instead. The Seating Dynamics Footboard can be used on numerous wheelchairs and flips-up to accommodate transfers. Why use a Footboard instead of Foot Plates? Depending of available range of motion or contractures of the knee and ankle joints, a client’s foot position may not align with a standard foot plate position. A footboard provides a wider surface to accommodate unique foot placements. Other Seating Dynamics hardware (listed above) can also be used to accommodate these needs. Many available footboards do not move for transfers or tend to fall back into position during the transfer. The Seating Dynamics footboard flips-up for transfers and remains securely out of the way until moved back into position by the client or a caregiver. The resistance of the telescoping section can be adjusted by changing a spring. Medium (Blue) is the default resistance and a Soft (Yellow) and Firm (Green) spring are included. The resistance of the elastomers in the knee joint can be changed from the Medium default (Blue) to Soft (Yellow). The resistance of the elastomers in the ankle joints cannot be changed. The elastomers in both joints should be checked annually to determine if replacement is required due to wear and tear. Please refer to our blog on this topic, Determining Resistance for the Dynamic Footrest.